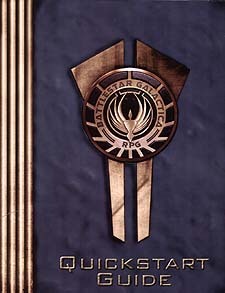 The Quickstart Guide contains a preview of the full Battlestar Galactica Roleplaying Game, with easy-to-learn rules, pre-made characters, and a short scenario that will allow the players to participate in the fall of Caprica, viewing it from a completely new perspective. Enjoy the game as a one-time experience or use it to launch a new series of adventures! Bring the action and drama of the hit television show to your game table. All you need to get started is this book, some dice, your friends, and imagination.